What is a slipcover copy? It’s a new slipcover I make by replicating your old one. I take apart your old cover and use it as a template. Your old slipcover will no longer be usable after I take it apart. Your new slipcover will fit as well as your old one if similar fabric is used. I can improve the fit of your new slipcover when minor adjustments are needed. I create a slipcover copy with the same excellent quality I put into making custom-made slipcovers for my local clients. Seams are stitched smoothly, reinforced where needed and seam allowances are serged to prevent raveling. Zippers, cushion boxing and welt cord are professionally set. Skirts are lined if necessary. Is a slipcover copy the right choice for you? You have to be ready to let go of your old slipcover and be OK with the new slipcover fitting like your old one or slightly different with minor improvements. A slipcover copy is for those of you who live outside of my area. When I’m not able to access your furniture to do a pin fitting , a slipcover copy is the next best thing. A slipcover copy is a custom made product and cannot be returned for a refund. 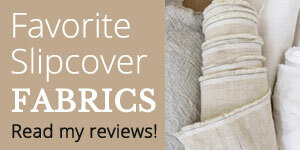 Ready to have your old slipcover copied? Email me with details about your project. Shipping & Handling: I ship within the U.S. only. Cost is calculated upon completion of your project.